Prominent arbiters of taste have criticized the CIA's deplorable tactic of cranking mainstream garbage into the ears of enemy combatants. WASHINGTON—Amid continued reports detailing the CIA's use of loud music to torture detainees at Guantánamo Bay, pop-culture elitists from across the country gathered in the nation's capital Monday to protest the uninspired song selections employed in the brutal treatment of inmates. "To remain silent about the abhorrent methods used to interrogate alleged enemy combatants would be a betrayal of the ideals we hold most dear," said New Yorker music critic Sasha Frere-Jones, a spokesperson for the loose coalition of music snobs. "I mean, 'Enter Sandman,' from Metallica's 1991 self-titled album? Really? Not to say there isn't some classic stuff on the torture playlist, but even my 12-year-old nephew would choose something a little more unexpected than Nine Inch Nails to shatter an utterly demoralized man's already tenuous grip on reality." "They could have at least picked an excerpt from Dream Theater's A Change Of Seasons EP to play at 120 decibels for 14 hours a day," Frere-Jones continued. "If I were handcuffed to a chair with something as tired as Tupac's 'Keep Ya Head Up' blasting in my face, I'd probably pass out from boredom, despite the painful sleep deprivation stress positions." In addition to deriding the CIA's song choices, protesters attacked the playlist's lack of variety, saying the music selected to abuse prisoners fell mostly within the categories of heavy metal and contemporary Top 40 pop. Rolling Stone senior editor David Fricke said the overall effect of the nonstop, unbearably loud music would have greatly benefited from delving into some of the subtler rock styles. "What those poor people have had to suffer through is a shameful travesty," Fricke said. "Can you imagine being forced to listen to Deicide and Drowning Pool all day long? Yes, the metal genre has a lot to offer, but why not broaden your palette a bit by throwing on something from Minutemen's Double Nickels On The Dime or even Roxy Music's Avalon after a few of the heavier tracks?" Added Fricke, "If the prisoner still had any idea who he was at that point, anything from those albums would totally blow his mind." 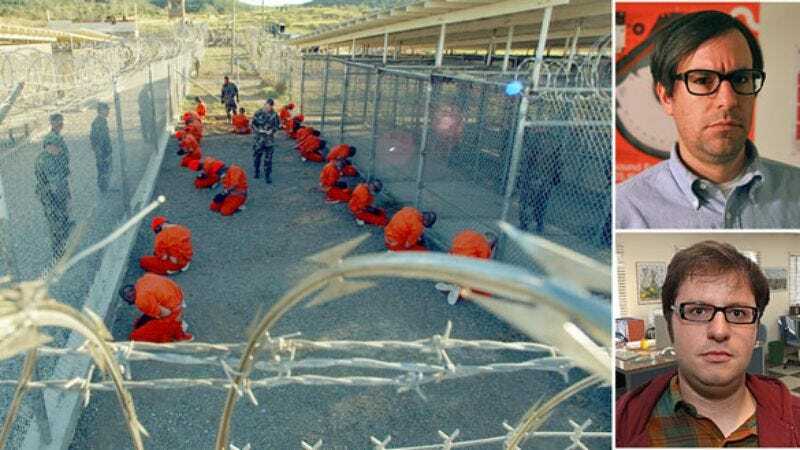 Last month, "Dean of American Rock Critics" Robert Christgau wrote a letter to the CIA offering to assist the agency in producing more sophisticated compilations for the systematic dehumanization of detainees, but he has reportedly not yet received a response. Though the activists all agreed that the musical tastes reflected in the state-sanctioned torture were laughable, the group was split along ideological lines into numerous factions. While many argued for the use of deep cuts from the Rolling Stones' 1972 double record Exile On Main St. to deafen prisoners and reduce them to whimpering children, others demanded that the infliction of irreparable psychological damage incorporate tracks by more esoteric modern artists like Simian Mobile Disco and the Black Lips. A small but especially vocal contingent tirelessly lobbied for the inclusion of at least one selection from Steely Dan's 1977 tour de force Aja, preferably the song "Peg." "Blatantly dismissing what the U.S. government has done to these men is an unconscionable miscarriage of justice," Pitchfork.com contributor Andy Ragazzo said. "I've been here for nearly six hours, and I haven't heard one person other than myself so much as mention the groundbreaking work of minimal techno and microhouse artist Ricardo Villalobos." "It almost makes me ashamed to be an American," Ragazzo added.